The history of literature is studded with doctors who wrote well. Chekhov could write a fine scene and wield a stethoscope well. Freud was praised for his style even by those who thought that psychoanalysis was tosh. However, Richard Asher should be more famous than he is. He's made a number of important contributions to psychiatry and wrote amusingly about not just doctors' dilemmas but doctors' deceptions - and self-deceptions. 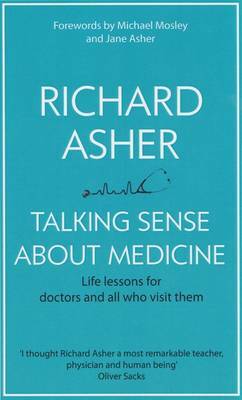 Asher made a name for himself by his articles in The Lancet which cast an affectionate but sceptical eye on doctors. Many of the subjects he raised - the tendency of doctors to prescribe too many drugs too easily and the dangers of excessive bed rest, especially in hospital - are still relevant 40 years after he wrote them. So are the Seven Sins of Medicine as well as his advice to young doctors on how to get on. He was regarded as "one of the foremost thinkers" of his time and hailed as a pioneer. This is an anthology of his articles still described as 'the best advice on medical writing'.